It’s on a rather short stem, but the flower is the right size. These two together make for the first pair of flowers in a plant that started was started from seed seven years ago, probably the longest I’ve waited for any plant to flower and also the longest I’m likely to wait! The strelitzia does seem to be making up for lost time however, after the current pair of flowers finish, there are still another two to come and with the plant having divided itself into several, it might not be too long before the large pot its currently in starts bursting at the seams. With the plant finally showing maturity, I’m, hoping we’re on an annual flowering cycle and this isn’t a once-in-seven-years event. 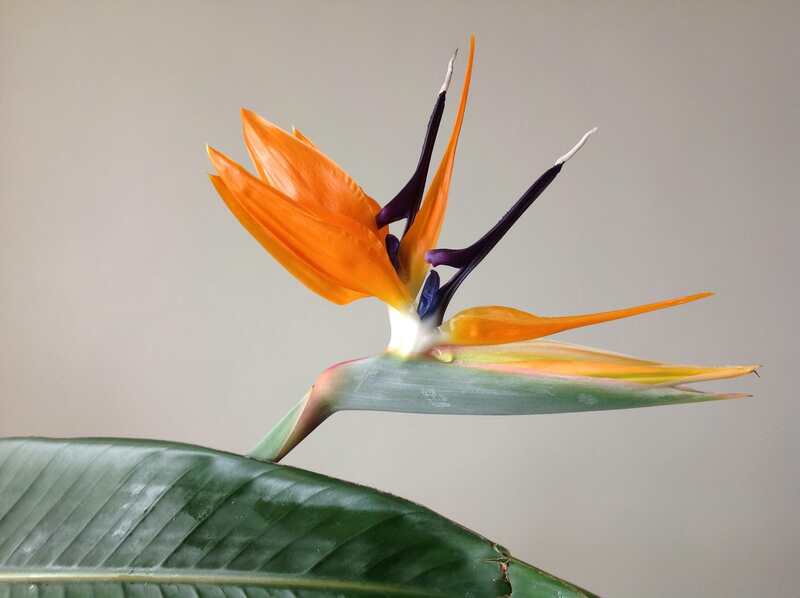 I must admit that it’s an unusual contrast looking at this tropical flowering Bird of Paradise plant, while the snow is coming down outside. It’s a shame we don’t have the equally vibrant Sunbird, to pollinate it. It looks like the wait was worth it Sunil. I have a few mini orchids growing on the windowsill in my office. It is so rewarding when they re-bloom – especially when it is snowing outside. I love having flowers nearby to help me hang on till spring arrives. You’ve nailed it, Lynn, having flowers to hang on to until the spring arrives. We might not have to wait that long though as we have Christmas Box flowering soon in the greenhouse, we still have the odd rose too! Magnificent! I only see those flowers in conservatories, but I always enjoy them when I do. Hello Jason, we have to keep these indoors over the winter but as soon as the night time temperatures stay above 5C, they go outside on the patio for the summer. Just beautiful! Worth the wait. Thanks, Jean, now I just have to make sure this is a yearly event! You’ve got me hooked this time Sunil. Bird of Paradise. My sister lived in Tenerife for many years, and always brought a bunch of these home for M & D when she visited. You couldn’t buy the plants here then. They are wonderfully exotic, aren’t they? Nip over to my blog for a Seasonal Greeting…. or not, as you like. See you next year! Hi Mrs. Mac, they are very exotic. I grew mine from seed bought here, my not-official in-laws grew theirs from a cutting bought when we were in Madeira. I’m hoping to end up with an exotic patio with these kinds of plants, might be cheaper than taking an actual holiday! Well done! A great achievement! Thank you, Jayne, we’re still enjoying the flowers! Hi Sunil, I admire your patience growing it from seed and waiting so long for a flower. Happily worth the wait. These plants seem to be popular and quite often seen in gardens round here. Because of this they don’t seem so exotic, but they since they’re not native to here, I guess they are literally exotic. Hello Catmint, if we were in a frost-free zone then I would have them all over the garden too! I mix definitions of “exotic” as being plants that are frost-tender or rarely seen or natively coming from sunny climes. It’s not the strictest definition, but I guess Dahlias would be a good equivalent example. They can just about survive our winters (in the South) but being originally from Mexico, they’re exotic but quite common here. Hello Sunil. How interesting, your experience with the strelitzia is almost exactly the same as mine, although I’ve had my plant longer than seven years and didn’t grow it from seed. I found your page today when searching for ‘strelitzia flower spike’ but only wish I had found it years ago when looking for information about the plant! Mine was strictly an indoor plant when small because it seemed to hate direct sun and leaves would curl up even when recently watered, just as you said with yours. It would grow new healthy leaves but then older ones would dry and go brown. A few repottings and continued larger growth didn’t actually equate to a very healthy looking plant and I had almost given up on getting the right conditions for it. Inside, outside, greenhouse, I couldn’t seem to get it right. Last Spring I repotted it, now divided and very pot-bound just like yours, and kept it outside and in a greenhouse overnight. It perked up and looked happier and continued to look better when indoors over the winter, although it has now got a bit of a lean towards the light! Today I was very surprised and excited to notice that the newest ‘leaf’ was actually a flower spike! It is a relief that my perseverance has finally paid off and the strelitzia is obviously happier with my efforts! I am really looking forward to the beautiful tropical flowers. Hello Ed, I also struggled to find the right conditions for Strelitzia. When I saw them in Madeira, they were growing everywhere so I thought they would be far less fussy. I’ve found that keeping the soil very moist and keeping the plant out of cold winds (so only outside between April/May to September) keeps them relatively happy. I hope your flower spike is worth the wait and is the first of many! Since my strelitzia’s flowering success, I have been given a couple of ‘rainbow’ strelitzia seeds and am now going to attempt the slow process of germinating them – in ten years time I might just be able to wish for a flower! Hello Ed, that’s very pretty! I’ve not heard of Rainbow Strelitzia but I wish you all the best with germinating the seeds and getting to flower. I’m going to stick with what I have as going through the process once is enough for me. The plant I have has divided itself several times (and is dividing again) so I can always split off divisions to create more. They’ll all be the same, but I don’t think that’s a bad thing!